**UPDATE (5PM)** -- Troopers have identified the victim of Monday morning's fatal crash on Interstate 75 in North Port as 63-year-old Thomas Mykins or Port Charlotte. According to Florida Highway Patrol, Mykins was headed northbound near mile marker 174 around 4:45 am when he attempted a lane change but bumped into another vehicle, running it off the road. Mykins' car rotated and came to a stop in the roadway. That's when another vehicle approached and slammed into the side of his car. Mykins then exited the vehicle, which was hit by another vehicle and pushed into him. Mykins was knocked to the roadway and pronounced dead at the scene. **UPDATE (12:30PM)** -- All northbound lanes of I-75 have reopened near mile marker 174. We're still awaiting details of the fatal crash and will update as we learn more. **UPDATE (7:30AM)** -- All southbound lanes of I-75 at mile marker 174 have reopened after the rollover crash there has been removed. In the northbound lanes, one lane was opened to allow traffic stuck on the interstate to move past the scene of the fatal crash there. Northbound traffic is still being routed off I-75 at the Kings Highway exit (#170). 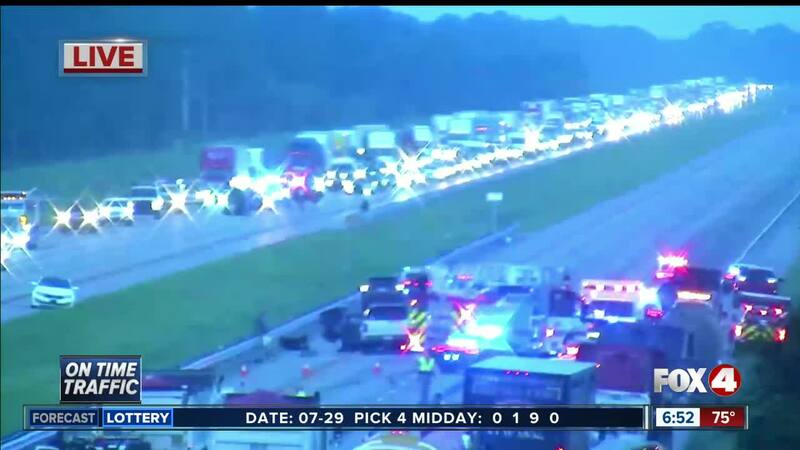 NORTH PORT, Fla. -- Crashes in both directions of Interstate 75 early Monday morning are causing backups. It's in the area of mile marker 174, between the Kings Highway and Toledo Blade Boulevard exits. In the northbound lanes, a fatal crash is blocking all lanes of traffic. Drivers should exit at Kings Highway in Port Charlotte and can re-enter northbound at Toledo Blade Boulevard in North Port. In the southbound lanes, a vehicle rollover in the center lanes has traffic reduced to just one lane. NPPD is assisting FHP with (2) separate roll over accidents on I75 at mile marker 174.!One is northbound and has the interstate shut down in that direction at Kings Hwy. The other is southbound with lane blockage. Expect significant delays in both directions. Avoid if possible.